Matt Lauer fired by NBC News, accused of "inappropriate sexual behavior"
NEW YORK -- NBC News has fired longtime "Today" show host Matt Lauer for "inappropriate sexual behavior." Lauer's co-anchor Savannah Guthrie made the announcement at the beginning of Wednesday's "Today" show. 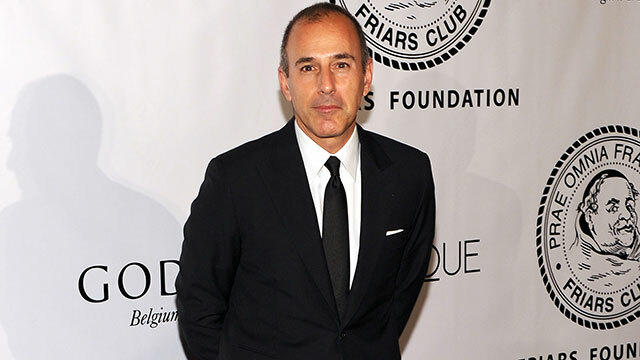 Guthrie read a statement from NBC News chairman Andy Lack, stating that the company had received a detailed complaint from a colleague Monday night "about inappropriate sexual behavior in the workplace" by Lauer. Lack's statement said the company found that after a serious review of the complaint it represented "a clear violation" of the company's standards, and Lauer was terminated as a result. Lack added in his statement that it was the first complaint about Lauer in more than 20 years at NBC, but "we were also presented with reason to believe this may not have been an isolated incident." "We are deeply saddened by this turn of events," Lack wrote. "But we will face it together as a news organization -- and do it in as transparent a manner as we can." Guthrie began Wednesday's broadcast by saying it is "a sad day here at NBC News." She noted that Lack had sent the announcement to staff just moments before she and Hoda Kotb went on air. "We just learned this moments ago, just this morning," a visibly emotional Guthrie said. "As I'm sure you can imagine, we are devastated, and we are still processing all of this. And, I will tell you right now, we do not know more than what I just shared with you. But we will be covering this story as reporters, as journalists. I'm sure we will be learning more details in the hours and days to come." Guthrie added that she was "heartbroken," both for her "dear friend" Lauer and "the brave colleague who came forward to tell her story and any other women who have their own stories to tell." Two hours later, NBC's Megyn Kelly noted the anguish on the faces of her colleagues but said, "what we don't see is the pain on the faces of those who found the courage to come forward, and it is still a terrifying thing to do." Kelly, who has written about being sexually harassed by former boss Roger Ailes at Fox News Channel, has covered the issue aggressively on the third hour of "Today," helping stabilize her hour of the program after it got off to a rocky start this fall. The firing of Lauer drew an immediate response from President Trump on Twitter. The news comes a week after CBS News fired "CBS This Morning" co-host Charlie Rose over allegations of sexual misconduct. Lauer had been co-host of "Today" since 1997, propelling the show to the top of the morning show ratings with co-host Katie Couric. It fell to second place behind ABC's "Good Morning America" following the departure of longtime news anchor Ann Curry in 2012 after just a year as co-host.